Accurate Fabrication | Accufab Machine Ltd.
We have made the aluminum lifting beams to fly 27,000 lb, 15′ x 65′ building under a Russian Liftair Mil26 helicopter as part of gold mining operation setup. Heaviest lift under a helicopter in Canadian history! 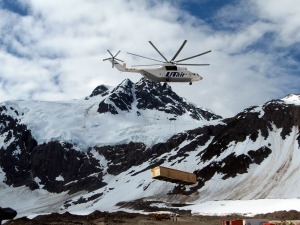 We also provided large lift baskets to fly fuel, food, tools, explosives, and boxes to fly core samples to companies in Alaska. We repair and supply new equipment to Vancouver Island Helicopters, which have found there way to Taiwan and Peru. We have made aluminum shipping boxes and specialized lifting carts to install and remove specialty equipment under a fighter jet for Jacobs Consultancy Canada. Performed repair of specialized military equipment preventing replacement at a cost of over a million dollars. Our shop has 24/7 video surveillance so delicate projects are secure.